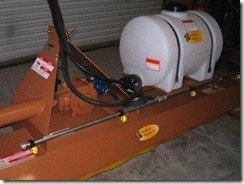 The PLR spraying system is designed to operate with the PLR unit. The sprayer boom can be used in front to incorporate or behind the PLR sprayer on the top. This allows the system to accommodate all types of chemical application requirements. The system is especially useful for litter beetles where they can be sprayed before they have time to tunnel down behind the PLR. It allows the house to be sprayed during the elimination of the litter crust saving a trip across the house. This lowers cost of operation by decreasing man hours and fuel usage. All types of poultry house chemicals may be used in the sprayer.